When you run solely for recreation and exercise, your pace is less important than getting in a good workout and meeting your distance goals. If you challenge yourself to improve your speed or to beat your personal record, your running pace becomes more significant. Meet your time goal by running with a pacer, who helps you to stay on track by maintaining a specific time per mile. A pacer helps you to finish a race in a specific time. Half-marathons and marathons often provide pacing teams for a variety of finish times. Pacing teams are led by experienced racers who are trained to help you maintain a steady pace. If your goal is to finish a marathon in 5 hours, for example, running with a 5-hour pacer will help you to maintain an average pace of 11 minutes 45 seconds per mile. The pacer's job is to set and maintain a specific pace, but you must choose a pace that aligns with your training and experience. 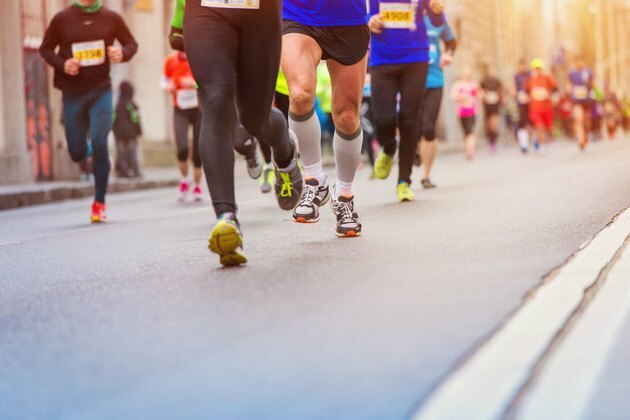 On his website, marathon trainer, former Olympian and author Jeff Galloway explains his "magic mile" formula, which is designed to help you estimate your pace for longer distance racing. Galloway suggests that you run 1 mile at a hard pace and multiply your finish time by 1.15 to estimate your per-mile pace for a 10K; multiply by 1.2 for a half-marathon pace and by 1.3 for a marathon pace. Unlike other pacers who set the pace and keep you on track, ultramarathon pacers generally aren't allowed to join you until the 50 mile mark, at an aid station. In this case, the pacer matches your pace, helps you stay on the trail at night, makes sure you eat and drink, assists you when replenishing your supplies at aid stations and encourages you as you run. The pacer isn't allowed to carry your supplies or physically assist you in running the marathon. The magic-mile formula gives an idea of your potential race pace, but it applies only if you train sufficiently for the planned distance. Pacers are guides to help you meet running goal, but listen to your body's signals on race day. If you are having an off day and need to slow down or walk, finish the race on your own time frame. Check with your doctor before changing your exercise program, particularly if you have heart or orthopedic problems.